British architect David Chipperfield’s Barcelona City of Justice and the Neues Museum, Berlin. The 2011 executive research tour was organised by the Court of the Future Network in Australia and New Zealand and the French Institut des hautes études sur la justice. It brought together judges, architects, court administrators and academics to visit significant court buildings, debate key issues in spaces that illustrate responses to these issues, and strengthen mutual understanding between participants from different jurisdictions. The tour was the fourth in a series. The tour began with the memorable Ciutat de la Justicia in Barcelona by British architect David Chipperfield in association with local firm B720 Arquitectos, plus two other smaller imaginative courthouses in Catalonia. There was also a repeat visit to Luxembourg to see the completed buildings of the European Court of Justice, guided this time by architect Dominique Perrault. 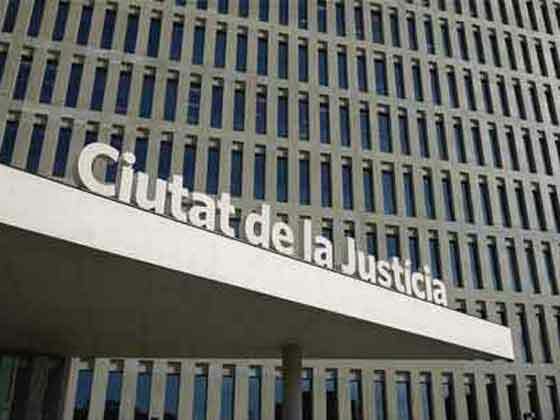 If the two small local courts in Catalonia illustrated careful management of scarce resources to produce striking modest buildings, the European Court of Justice, like the European Parliament proclaimed a more opulent vision, with a ceremonial courtroom that dazzles and towers that glitter. The second week began with two more pragmatic courts located in Dusseldorf – the new local and district court, designed by local architect Andreas Rau, and a new high security court for counter-terrorism cases. While the buildings were perhaps most distinctive for the quality of their planning and their low energy use, they also contained significant works of art. The visit continued in Berlin with a visit to the only new courthouse built in Berlin since the war, a family court by architect Oswald Mathias Ungers, most famous for his preference for his repeated use of basic shapes like cubes. In Berlin the tour also took in the famous Kammergericht, which provides a microcosm of Germany’s troubled twentieth century history, plus a former courthouse that, with an imaginative addition by Daniel Libeskind, is now the Jewish Museum. A modest but memorable building on the tour was a building that on the surface is nothing like a court. It is a social therapy workshop, using Steiner principles, to provide useful work for people with disabilities. The building, full or rich colours and light, was designed in close collaboration with the users; as a result one side of the building bears an uncanny resemblance to a pirate ship. A visit to Berlin is not complete with going to the Reichstag building, and walking up the spiral walkway to the tower. The tour concluded with a visit to a second Chipperfield masterpiece, the Neues Museum. Museums, like courts, try to strike a balance between remembering the past and engaging with current issues. This museum, badly damaged by wartime bombing, bears its scars proudly, with exposed walls paying tribute to the original 1850s design. The various themes explored over the two-week period are summarised in the form of images and text in this Report. Some of these reflect the buildings we chose to visit – security for example was illustrated most dramatically in the fortress-like high security courthouse in Dusseldorf, while history was deeply – almost painfully – inscribed in almost every space we visited in Berlin. Other themes, like equality and transparency, reflect principles that inform in different ways the design of modern buildings, while history and ownership speak to the way the buildings engage with local communities and national stories. One theme, that is as old as the ‘bar’ that has delineated justice spaces from the time of medieval kings, is the concept of the threshold. In the new courts in Dusseldorf, the transition across the skyway from Landgericht to Amtsgericht is marked by a change in colour. In the family court in Templehof-Kreuzberg the transition from court to a children’s waiting area is a magical glass corridor.